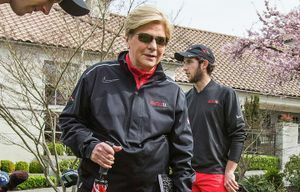 Swanson, 69, is a local golfing legend who was the first female to play on a community college men’s team. It struck Ann Swanson the moment she walked into a coaches’ meeting before a tournament last year in El Paso, Texas. But that comes with the territory when you are an assistant coach for the Seattle University men’s golf team. Swanson, who also assists the Seattle U women’s team, does not know of another woman who is assisting a men’s Division I program. Golf highlights: Nine-time Washington state amateur champion; seven-time Seattle city champion; qualified for three U.S. Women’s Opens. She is in several halls of fame, including Pacific Northwest Golf, Grays Harbor Community College and Aberdeen High School. Did you know? She has written two books, and the first one, on the history of women’s amateur golf, was selected for the USGA Museum of History. She won the 1989 Washington Women’s Amateur and Seattle City Amateur while wearing a walking cast recovering from a broken leg. The 69-year-old is used to being a trail blazer. A local golfing legend in Washington, it would take a page to list all of her accomplishments. She said a lot of her success stemmed from playing for the Grays Harbor Community College men’s team, the first female in the state to play on a community college men’s team. Swanson is less into playing these days and more into giving back to the game. When Seattle U men’s and women’s coach Mark Chandonnet asked Swanson before the 2014 season if she was interested in assisting him, she jumped at the chance. Swanson soon discovered that the players at Seattle University had their own swing coaches. Most of the advice she gives is on the mental side of the game. Indeed, Swanson’s job includes fundraising and preparing for tournaments, including hosting the big event of the year for the men’s team, the Seattle University Invitational at Chambers Bay golf course in University Place on Monday and Tuesday. The course, which will host the U.S. Open two months later, should provide a tough test for the 18-team field, which includes the University of Washington. The Redhawks are a young and improving team. Swanson said the team is ready for a big breakthrough. She won’t pick which team she enjoys coaching the most. Although Swanson and Chandonnet don’t tinker much with players’ swing mechanics, they are stressing a new concept called Fluid Motion Compact. But Swanson’s tips are not just related to golf. “This is about life,” she says. It’s the life lessons that Swanson can deliver that intrigued Chandonnet when he hired her.